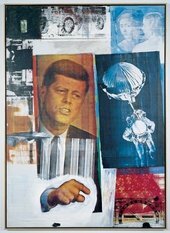 The abstract expressionists were mostly based in New York City, and also became known as the New York school. The name evokes their aim to make art that while abstract was also expressive or emotional in its effect. They were inspired by the surrealist idea that art should come from the unconscious mind, and by the automatism of artist Joan Miró. 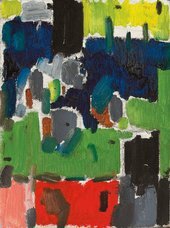 Within abstract expressionism were two broad groupings: the so-called action painters, who attacked their canvases with expressive brush strokes; and the colour field painters who filled their canvases with large areas of a single colour. 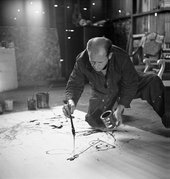 The action painters were led by Jackson Pollock and Willem de Kooning, who worked in a spontaneous improvisatory manner often using large brushes to make sweeping gestural marks. Pollock famously placed his canvas on the ground and danced around it pouring paint from the can or trailing it from the brush or a stick. In this way the action painters directly placed their inner impulses onto the canvas. 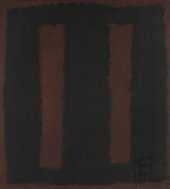 The second grouping included Mark Rothko, Barnett Newman and Clyfford Still. They were deeply interested in religion and myth and created simple compositions with large areas of colour intended to produce a contemplative or meditational response in the viewer. In an essay written in 1948 Barnett Newmann said: 'Instead of making cathedrals out of Christ, man, or ‘'life'’, we are making it out of ourselves, out of our own feelings'. This approach to painting developed from around 1960 into what became known as colour field painting, characterised by artists using large areas of more or less a single flat colour. Simon Grant talks to Brice Marden about his enduring fascination with Rothko’s paintings. Gorky's wife Agnes "Mougouch" Magruder talks about the life and work of the extraordinary painter.